1 of 4 In a large bowl, whisk together flour, sugar, baking powder, salt, cinnamon and nutmeg. Fold in apples. Stir in cider, eggs, butter and vanilla until combined. 2 of 4 Heat oil in a large, heavybottomed Dutch oven to 375 degrees . 3 of 4 Form 4 fritters, using a 1/3-cup ice cream scoop, and drop into oil. Fry for 3 minutes; turn and fry an additional 3 minutes. With a slotted spoon, remove to a cooling rack placed over a baking sheet. Repeat until all fritters are fried. 4 of 4 Combine confectioners' sugar, cider and Calvados. 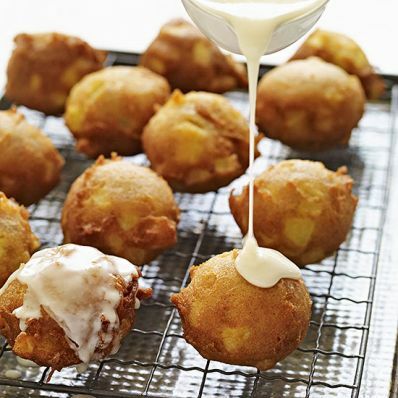 While slightly warm, spread a heaping tbsp of the glaze over each fritter. Serve slightly warm or at room temperature.